The compact crossover segment is one of the hottest segments right now, and every automaker wants its share of the sales pie, including Nissan. The 2012 Rogue is Nissan's entry into this segment, and it has the options you would expect from a crossover in 2012. We recently spent a week with a silver SV AWD tester to find out if it has what it takes to win consumers' hearts. Visually, the Rogue isn't a stunner. We wouldn't call it ugly, but it isn't aggressive and is somewhat bland in an age where many competitors feature sharp creases and flowing lines. 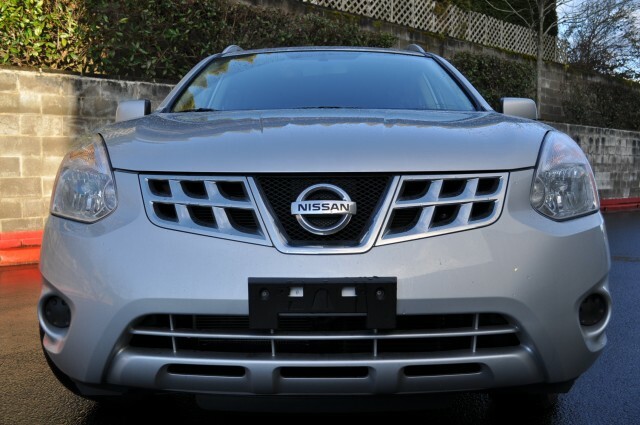 Our tester featured a chrome grille which made the front end appear to have somewhat of a cheese grater look, while still showing its family resemblance to the larger Nissan Murano. The 17-inch alloy wheels fill out the wheel wells, while the chrome door handles and trim along the bottom of the doors helping to break up the otherwise slab-sided appearance. A very soft character line runs down the side intersecting with the door handles. Inside our tester we found a sea of black plastic, which made it a very dark place to spend our time. The dashboard features a simple design with easy-to-use controls for the infotainment and climate control systems. All controls are easily within reach of the driver while a six-way power seat makes getting comfortable easy. But a lack of a telescoping steering wheel may be an issue for some consumers. Our tester featured Nissan's navigation system with a five-inch color touch-screen. This system incorporated XM satellite radio and traffic updates, both of which worked quite well. Unfortunately there are no electronic features that might help a consumer drive in a more eco-conscious fashion. The overall system was easy to use with large buttons and clear on-screen prompts when using the hands-free Bluetooth phone functions. Being a hard-drive based system, functions such as entering a destination and changing map views all move quickly. Unfortunately, once you enter a destination, it takes quite a long time for it to actually begin routing you. The 2012 Rogue comes with a 2.5-liter four-cylinder rated at 170 horsepower and 175 pound-feet of torque. While front-wheel drive is standard, our tester featured the optional all-wheel drive. The only transmission offered is a CVT which Nissan calls an Xtronic CVT. Power off the line is good but fades fast as you gain speed. Hitting 60 mph will take just under nine seconds as the CVT attempts to keep the engine in its most efficient range. Under hard acceleration the engine produces a coarse drone and can become quite loud. With an EPA rating of 22 mpg in the city and 26 mpg highway, we saw an average of 22.9 mpg in mixed driving. The all-wheel drive does sap 1-2 mpg off the EPA ratings, though it might be worth it for those who live in a snowy climate. These EPA mileage figures are nowhere near class-leading. The Nissan Rogue isn't likely to draw buyers looking for the best fuel economy. Competitors like the new Chevy Equinox (which scores up to 22 mpg city and 32 mpg highway), and the upcoming 2013 Ford Escape (up to 31 mpg highway), will offer more attractive fuel-saving alternatives. In everyday driving the Rogue features a quiet interior and a driving position that crossover shoppers are looking for. The rear seat is spacious enough for two adults and the cargo area is more than willing to swallow 57.9 cubic feet of luggage. With an as-tested price of $27,920, the 2012 Rogue is in the heart of the crossover market. With unique in its class available features such as Nissan's Around View Monitor and Xenon headlights, the Rogue is a compelling vehicle for those who seek a well-packaged crossover that isn't going to be on every other block. But if fuel economy is one of your main priorities, the Rogue probably isn't for you. For more information on the 2012 Nissan Rogue be sure to read our full review right here.